Though I grew to be much taller, I have always looked up to her and she always looked out for me. I even moved to Gainesville for college just so that I could be closer to her and Steve. That admiration and respect and love for Sandy continued with my daughters Miranda and Sadie. She just showered them with love and attention and they were Aunt Sandy’s biggest fans. With her health worsening, she fought so hard and in May she shared the joy of seeing Miranda marry Adam and in August, Sadie start her freshman year at Florida State University. With the pain of losing my precious sister, I am comforted that she is at peace and in the arms of our mom and dad. Sandy was my girl next door. In 1978, I opened Sandro’s at 10th and University in Columbus, Ohio, home of my sister and niece. It was pretty much love at first sight when this beautiful blonde who worked in the clothing store next to Sandro’s walked in. In addition to being beautiful, she had the warmest smile and turned out just loved our deep-dish pizza. Love of pizza turned into romance and within two years, Sandy was in Gainesville and on February 11, 1980, became my incredible wife. I taught Sandy pizza business and she taught me so much more. She taught me patience, relaxing and the importance of physical fitness – health of body, mind and sprit. She laughed, she smiled, and she fulfilled all of the business responsibilities of Leonardo’s Slice, the Bistro and 706. Staff, which are now in the 3rd generation, loved her spirit and had so much respect for her as well. We had a chance to travel together, enjoy theater, concerts, lectures, sports, and share times visiting family and friends. There was so much more we wanted to do but are grateful for what we enjoyed together. With the devastating diagnosis of non-small cell lung cancer, she taught me about how to be brave. Through all her surgeries, chemo and radiation treatments, she kept a positive attitude. 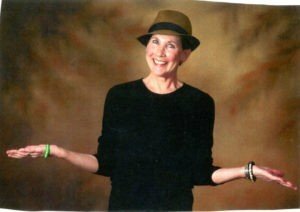 She battled courageously for herself and for a cure for others, in the past as co- chair for Run Amuck for the Duck, the race benefitting Bonnie J Addario Lung Cancer Foundation. I will miss her smile, her laugh, and the beautiful life we shared together. I am heartbroken but I take comfort in her words to me that she knew I was always there to help her fight and now she was ready. A friend said it best, “she is now among the angels.” I love you forever my angel. Words of admiration for Sandy and the grace and courage and giving spirit she possessed were echoed by friends,family, neighbors, employees and even our Leonardo customers. A Celebration of Sandy’s life will be held on Sunday, January 27 , from 3 to 5 at Leonardo’s 706.
for her love of animals, most recently her beloved Leo who went from rescue to service dog.